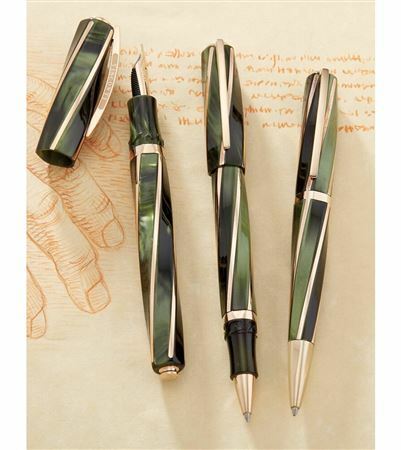 Order your Visconti Divina Elegance Green Oversize Fountain Pen today from FahrneysPens.com. Fine Pens, Refills & Luxurious Gifts – great prices & fast shipping. 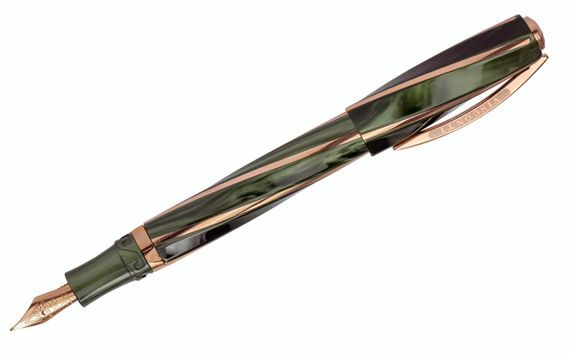 Visconti welcomes the newest addition to its iconic Divina Elegance Collection - a stunning pearlescent green resin with precious rose gold-plated bronze trim. An evolution of the timeless Divina series, the Green Divina Elegance has the same spiral-shaped body and perfect proportion based on the golden number of 1.618, the ideal ratio in Western art and science. The signature metal rods that encircle the pen are solid bronze plated in rose gold. The Divina Elegance is a coveted Visconti design that offers luxury, functionality and a great feel in the hand. The fountain pen is available in Oversize or Midi models: both feature Visconti’s superbly flexible 23K palladium Dreamtouch nib plated in rose gold, and a unique Pull & Turn filling system. An innovative hook-safe locking system aligns the pen and cap securely. The Midi capped rollerball and twist ball pen complete the Divina Elegance series. Bottle fill only.